Last weekend Phenom hoops assembled some of the best talent across the states of North Carolina and South Carolina for the Feast of Champions. Here are some of the highlights from some of the Marquee games. 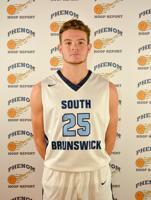 Game 1 on Friday featured South Brunswick vs Eastern Guilford. South Brunswick fell to Eastern Guilford. But Jace McKenney a 6-6 small forward class of 2019 stood out in the crowd. Jace has a smooth floor game with confidence and Swagger. His 16points, 8 rebounds and 6 blocks. Help keep his team in the game and make a tremendous third quarter run. Jace proved to be a serious weapon. At 6’6 he runs the floor extremely well and transition and he understands how to establish positioning on the Block but he also brings the capability to score from Deep he hit a pair of Threes in the corner and showed a nice touch from mid-range what stood out defensively was finished footwork and quick lateral movements. A solid performance that earned him a spot on the list for Best in Show. Also in game one Eastern Guilford had some standout guards. Montez Venable and Jalen Alston might have been the best backcourt tandem at the feast. Montez a 6’0 combo-guard from the class of 2018 went for 15 points and six assists. Montez is a superb open floor distributor. He has great Court awareness. He also brings a scores mentality with a good mid-range game, he is very creative he is a problem for the defending team in transition he makes plays. His back-court team-mate Jaylen Alsten, a 6’4 combo-guard from the class of 2018 also. Is long and athletic. He can play the point guard position as well as the two. Whether it’s in transition running or simply running a set offense. His basketball IQ and athleticism combined with his length create a problem for Defenders. Jaylen utilizes a terrific change-of-pace to set up his move and his man he is also a very strong rebounder. In a winning effort Jaylen contributed 28 points and 12 rebounds from the guard position and 3 blocks. In the second half Jaylen and Montez combined to deliver the knockout punch. Game 2 featured Fayetteville Academy the host school vs Cape Fear Christian. Two nearby rivalries. This was a hard-fought game Fayetteville Academy, Eric Bethea stood out and earned himself a spot on the Best in Show list for Friday night. We love watching this kid and haven’t seen him since this fall when he was a standout at the Phenom camp in September in Greensboro. He is a smooth combo-guard that pushes the ball and plays with great pace. Eric has a great feel for the game and gets his teammates involved early and often with his penetration and drive draw and kit or drop off passes. He keeps the defense on its heels. He then truly plays to his strengths a shooter off the dribble coming off screens this kid can flat-out shoot the Rock. with a smooth stroke quick-release and Eagle Eye watching him shoot the ball is a thing of beauty. Also, very active on the defensive end with good lateral movement and quick hands he’s a Lockdown Defender. And good enough to make the list for Best in Show. 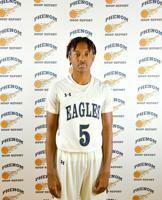 And for Cape Fear Christian Riley Adams a 6’ guard in the class of 2019 had a tremendous game with 17 points, 7 rebounds and 5 assists. Riley is a point guard that executes the intangibles a glue player smart and when we say smart we mean smart a very high basketball IQ. He is very smart with the ball in his hands but he is also mastered the skills of playing without the ball. Returning from a season injury ankle injury less than a year ago. This young combo guard came to play. He has handles as good as any point guard you’ll ever find he attacks and finishes in transition consistently attacks the rim Elevate on a mid-range game, and can and can shoot the three ball. His speed is not yet 100% but he showed us that he could push the basketball from end-to-end and make great decisions and transition. It’s just a matter of time but this kid is one to watch and he definitely earned a spot on the best in show. 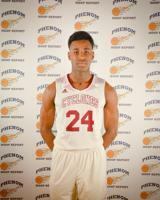 Also from Cape Fear Christians Milos Galogaza a 6’8 class of 2018 4/5″ poured in 15 points pull down seven rebounds and had two blocked shots. Mibs has superb hands which he uses to Chorale rebounds. Milos has legitimate post moves and a great touch around the basket. He can finish with either hand in the paint. He Powers through contact in the Lane. 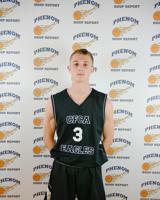 What we like about this kid is he competes and plays with great energy and urgency on both ends of the floor. Putting him soundly on the Best in Show list. Game 3 featured Village Christian Academy and Porter Gaud. A matchup of two Titans both defending state champions. Right of the bat Travion McCrae a 6’1 class of 2019 combo guard established himself as a problem for the other team. With 21 points 6 rebounds in 4 assists on the night, without question he is one of the best combo guards and Cumberland County arguably one of the best in the state of North Carolina. Friday night at the Feast of Champions he showed us that he is a next-level player. With a smooth stroke, and an explosive up-tempo game. He converts in transition and can knock down the mid-range jumper off the bounce with ease. Travion has the mentality of a point guard with a very high basketball IQ. He makes sonic Reed in the half-court and he is a leader. Very vocal. It was a hard-fought battle but watching him was worth the price of admission if you need a bucket give him the ball clutch at the free throw line. And able to attack from any position against any defender on the floor. He has that Killer Instinct. Ultra-athletic with explosive footwork a great first step attack. He has that ability to hang draw contact and finish in traffic. He is definitely among the elite players in the class of 2019 and his performance Friday night puts him on the Best in Show list. Porter Gaud had three standout players of their own as they got the win over Village Christian. Aaron Nesmith 6’6 shooting guard Wing in the class of 2018 had a game leading performance with 25 points 3 rebounds and three assists for his team. Aaron was impressive all day. Shooting the ball with a quick release and good form and rotation on his shot he was able to knock down threes and mid-range jump shots as easy as looking at the basket with the ball in his hands. A-zone killer. He makes you think twice about playing a Zone against them. Aaron plays defense with a tenacity and takes it personal something that every coach looks for in a kid. he took pride in guarding his man which just happened to be one of the best players on the other team who’s also on this impressive list of standout players. Already a D1 committee we like to see him put on about 20 more pounds of muscle and he will be one to keep an eye on next year and the college ranks but for now he is definitely Best in Show. Josiah James 6’7 class of 2019. Josiah is a long and athletic combo guard. He put up 12 points pull down 11 rebounds, had five blocks and 5 steals that’s right defense! If you’re thirsty cut this kid open he’s got ice water in his veins Place downhill attack mode only. he kept the defense guessing and moving backwards all day. A tremendous athlete with a good body that’s almost college-ready. A very good shooter a very good passer a very good ball-handler but it’s his tenacious attitude and ranging defense that made him a standout. And earned him a spot on the Best in Show list for Friday night. Jake Lanford. 6’10 class of 2018 post player. A kid with a great attitude High basketball IQ and a bit of an old-school post game back to the basket. in a winning effort, he gave his team 18 points 12 rebounds and to block shots. Jake is a strong and physical Center that runs the floor well he continuously beats opposing centers down the floor for easy baskets on rim runs he has a powerful drop step and short baby Hook off the dribble which he’s able to finish. In the paint, he can score with either hand a big plus it makes it hard for the fenders to push him one way. He has a great touch around the basket and has excellent hands. when I mention an old school throwback he doesn’t mind physical play and is willing to mix it up in the paint with the best of them definitely deserves a spot on the Best in Show list probably the best pivot player we saw Friday night.